Was the option to have those green arrows on google searches removed? 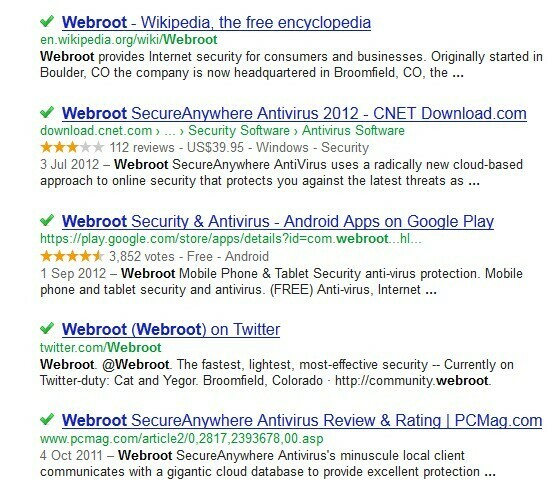 I never really liked the green arrows on google searches my myself anyway because when you clicked on them it only took you to Webroot.com instead of giving you handy info about why the site was safe or not. But I was just wondering where the option is for turning the green arrows on or off went? It's definitely a trade-off at the moment. HTTPS is definitely more secure, but due to the way it works, it stops the annotations from working. Luckily, its only the annotations that are affected. If you went somewhere that was flagged as bad, it would alert you anyway. I know we are looking at ways to have annotations work on HTTPS, but right now it is in fact a technical limitation. There was an interesting new idea submitted today regarding this topic in the Ideas Exchange! The setting to turn on/off the green checkmarks and red X's can be found through Settings>Web Threat Shield>Analyze search engine results and identify malicious websites before visitation. Keep in mind that as of right now, these green arrows and red X's function in Firefox and Internet Explorer and Google needs to be using an HTTP instead of an HTTPS connection for that to work. And how do I get google to use HTTP instead of an HTTPS connection? Because as of this moment I can not seem to get the green or red arrows to appear on google searches in either IE9, Firefox or Chrome. Hi Gate nice to see you again http://www.google.com as I have it bookmarked and it should only show in IE & FF at this time! I have a very strange thing going on here. When I am logged in to my google account google searches always is using "HTTPS" when I am not logged in to my google account it uses "HTTP" and then I can see the green check marks. Any idea why this is and can I change it? Also what is the difference between HTTPS and HTTP? And why can't the green check marks work with both of them? Recently Google announced they will redirect their logged in users to the HTTPS version of their search engine! Here is a web site explaining it. Apparently using HTTPS for google searches is a very good thing for safety reasons. So the question I have is will Webroot add support for HTTPS when using the Green Checks Marks for google searches? Also it seems when you are logged into google there is no way to switch the default HTTTPS to HTTP. Although it does sound like using HTTPS is safer and recommended anyway. There's many Great support people here already! I guess I will not submit a new ticket since as you said it's already being looked into.